Since the famous papal bull “Inter caetera” by Pope Alexander VI, according to which the Catholic kings of Spain and Portugal were ordered to guard all the occupied territories of the New World, the Church, except in exceptional cases, had always been one of the pillars of the government in the region. In Mexico, Argentina, Peru and Ecuador priests were among the noble class, and as the owners, always fiercely opposed the reforms and new practices. The Church insisted on maintaining the status quo by supporting political regimes. The priests protected the dictators’ and aggressors’ rights through Judicial-military and church courts. Since 1511 in which, with the approval of Charles V the King of Spain, two universities were founded in Mexico and Lima, until the last decades of the eighteenth century, in those two universities and other universities that were established in other places, university education was under the influence of the church. But gradually the power and influence of the Church lessened and Native Americans and African immigrants could benefit from university education. Despite widespread opposition, the Church has always backed up its control over public education (Eliade, 1993: 3). Apart from religious activities, the Catholic Church dealt with many earthly affairs including trade. As a result, the church had become the dominant political and economic system which even rose the envy of some of the rulers in the region. The church owned the lands and sometimes banks and companies, and to a large extent determined the fate of the colonies and then the first republics. Except for the Basic and intermediate level priests, the rest of the clerical system of the church fought against the liberal and pro-independence movements. Treason was considered the same as Apostasy. Likewise, the church issued rules to ban participation in the wars for independence in the region and stopped the Indians’ and blacks’ anti-oppression and liberation activities. Thus, over four centuries, the colonial Spain and Portugal, together with the church, took the politics as well as the economics of the region in their hands and plundered this land. In all these countries, the wealth of the region’s churches increased and in some of them, like Mexico, in a period, more than half of fertile lands were owned by the church. In many others, such as Ecuador it was the main land owner and sent boxes full of gold and silver to Rome (Beals, 1974; Stein, 1970). Prior to the independence of Latin American countries, all the countries except Brazil – which was a Portuguese colony – were colonies of Spain. Since the Pope, in the early years of the discovery of the new continent, granted the privilege of appointing bishops and delimiting the caliphates to the Kings of Spain and Portugal, the church was exactly in the service of the governing power and acted in accordance with it. Consequently, the church in Latin America was under the political, military and religious dominance of the Spanish and Portuguese Kings. Prior to the independence of the countries in the region, most of the bishops were Spanish and obviously such church was serving the interests of Spain. The revolutionaries who fought to achieve independence, not only the had to fight the governing power, but they also had to fight the church. The fight which was very effective later in the growing of revolutionary Christian movements of the region, including the Liberation Theology. That’s why some people believe that Latin America’s post-independence history of the Church is nothing but an attempt to be released from the colonial heritage of Spain and Portugal and adapting to the new situation; a process that is still going on. The last quarter of the nineteenth century was the period of serious decline for the church in the West and the Christian world. During this period, due to fierce adherence to traditions and a serious lack of innovation, the church gradually lost its reputation when it was confronted with the scientific empirical approach. With the rise of “secular” and anti-religious ideologies in these years, anti-religious discourses became dominant in society. Harassment of monastic communities and their expulsion from some countries became commonplace. This spirit prevailed even in South America; but in any way Catholicism continued to exist and this led to efforts to renew and revitalize the Catholic Church. In 1899, the first General Council of Latin America, in which 13 archbishops and 41 priests from Latin America attended, was held in Rome. 998 articles were presented at the conference in which the issues of the Catholic communities of this region were referred to as: Liberalism, superstition, Freemasonry, atheism, Protestantism and Socialism. However; new approaches to these issues had not been adopted as the Church insisted on continuing its tradition, the conservative. After the conference, the church attempted to deepen its conventional intellectual and cultural traditions in Latin American countries and established ecclesiastical schools in different levels of education. These efforts reached their peak with the establishment of many universities (Eliade, 1993: 3). Nineteenth-century is the century for America’s serious presence in the region and its competition with Spain and Portugal in the area. In 1823, James Monroe, President of the United States of America, presented his famous doctrine about the region. According to this doctrine, North Americans regarded any involvement in the region by European powers as an unfriendly act and would answer it. At the beginning of the twentieth century American President, Theodore Roosevelt, developed this doctrine during his term of office. He called North America the police of the region who could even have military intervention to solve the problems in some neighbor countries. US troops were involved in their southern neighbors more than seventy times and to keep this lucrative paradise, did everything possible, including political pressure, economic sanctions, overthrowing the governments and open military meddling (Fekri, 1349). In Latin American countries, the FBI and local police served as a complement to America’s military bodies’ activities in the region. CIA agents began covert activities throughout Latin America. FBI began to make false allegations against all opponents of imperialism in the region and all those who were critical of the United States. Sometimes it prevented their journey to the United States and some other Latin American countries. They had supervision and control over most of the public media in the region so that they did not act contrary to the demands of the United States. Many CIA agents, played the role of a reporter. Some writers, directors of publications and textbooks as well as Catholic charities of the region were paid regularly by the United States; consequently many people considered the Christian charitable foundations and Churches as American. Many priests and bishops supported the interests of the US and ignored the protests of poor people (Fekri, 1970; Beals, 1974). Another form of US actions was supporting and expanding the Protestant missionaries’ activities in Latin American. It can be said that with the expansion of America’s hegemony in the region, the Protestants’ activities and their propaganda in this region began to increase (Mostafavi Kashani, 1374). Latin America is now one of the largest domains of Christian culture that has formed as the result of the integrity and coexistence of indigenous people and Native Americans who had a basic religion and the Catholic European immigrants. Massive migration of Africans in many parts of the region (especially in Brazil and Cuba, as well as Haiti and Colombia) and the subsequent migrations of Europeans had an enormous impact on the religion and culture of the people. This has caused the formation of a complex mixture of culture, traditions and the religion of each settler in this new land (Walls, 1358). Reaffirming the forgotten Latin American indigenous cultures and religious traditions and making efforts towards reviving them are the trends of the current era in the region. On the one hand, the Christians make great efforts to express the life and teachings of the Christ in a way that indigenous cultures are seriously taken into consideration. On the other hand, some scholars and researchers who are interested in Indian culture and traditions are trying to revive the culture, customs, traditions and Indian rites. As a result, the current Christianity in the region is more flexible than what it used to be in the past (ibid.). 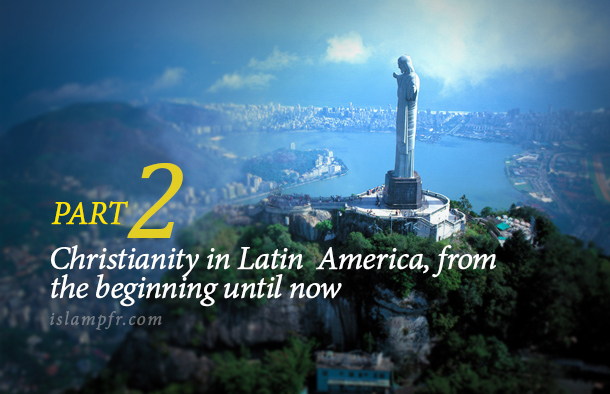 More than 80 percent of the Latin America’s 600 million population are Catholics. As a result, nearly one third of the world’s Catholics live in this area. The situation of the Catholic Church has changed compared to the past after the independence of some countries in the last century. For instance, in Mexico after the revolution in 1911, the government got into the hands of people who strongly disagreed with the church and religion and the clerical class and they confiscated church properties. Until 1935 in fourteen out of the 29 states of Mexico, priests were not allowed to perform religious ceremonies, although eventually these obstacles were overcome. However; the Church properties which are considered national and governmental property are run by the priests (Elder, 1971; Beshiriyeh, 1997). After Fidel Castro came into power in Cuba through the 1959 revolution and the communist ideology became dominant in the country, the Cuban Church faced a difficult situation. Because of the church’s cooperation with the old regime, many priests fled to the US and other countries in the region. In Cuba the number of Christians dropped into half since the Cuban Revolution. Now, after more than half a century of the Communist Party’s dominance in Cuba, there is a more favorable condition for the Catholic Church than it was in the past. Pope John Paul II’s visit to the country (in 1998) and his talks with Fidel Castro were effective in improving the relations of the Cuban Catholic Church and the government. Another recent important development in the region’s Catholic Church is sending many Catholic priests from the United States of America to countries in the region from 1950 onwards, while in the past all the priests of the Catholic Church were coming from Spain or Portugal. In addition, several major universities and the Catholic Educational Centers were established in the region including: Bogota (1937), Lima (1942), Medellin (1942), Rio de Janeiro and Sao Paulo (1947), Quito (1956), Buenos Aires and Cordoba (1960) and Valparaiso and Guatemala (1961) (Eliade, 1993: 3). One of the weaknesses of the Catholic Church in the region is the shortage of priests and its reliance on dispatching priests from foreign countries. In recent years, the dispatched priests from the US and Europe were engaged in widespread promotional activities among the Indian tribes of mountainous areas (Elder, 1971). Although the majority of people in Latin American republics are considered Catholic, religious freedom is guaranteed in the laws of these countries. However; in countries such as Venezuela, Colombia and Argentina Catholicism is the official religion and special attention is paid to it. On the other hand, in countries such as Mexico and Uruguay religion and government are completely separate. For instance, in Uruguay, Christmas  is celebrated as “Family Day”, Easter as “tourists’ week” and the sixth day of January, which coincides with the Epiphany  as “Children’s Day” (Mostafavi Kashani, 1995: 48, footnote). Although Latin America has been under the influence of Catholicism more than three centuries and it is still known as a Catholic land and Vatican parochial, in recent decades, a wave of Protestantism in this area has emerged and millions of people across the continent have converted to various branches of Protestantism, especially Evangelicalism  and Pentecostalism . By the 1930s, the number of Protestants in this region was limited; but since the 1960s, following the official Catholic Church’s controversial positions regarding the liberation theology, their numbers have greatly increased, especially in Brazil. In 1914 in all Latin American countries, there were only a little more than 300 thousand Protestants; but the number of Protestants in 1949 reached 4.5 million and in 1961 to at least 6 million people. During the last three decades it has reached more than 40 million. Although many still believe that the fabric of society in Latin America is intertwined with Catholicism and that Protestantism’s growth cannot compete with it, the growing number of evangelicals has attracted the attention of researchers and sociologists. Meanwhile, United States of America plays an undeniable role in increasing the followers of Protestantism (Mostafavi Kashani, 1995: 115 and Haynes, 1999). Pentecostalism sect has played an important role in promoting Protestantism in Latin America; In particular, their activities in Chile have been very effective. Interestingly, the first Pentecostal church to join the World Council of Churches  was from Chile (Elder, 1349: 189). In some countries, especially in Colombia at one point, there was a very fierce opposition against Protestants. During eleven years in that country, between 1948 and 1959, 115 people were killed and 66 Protestant churches were destroyed and during the same years the Colombian government shut down about 200 Protestant schools; but with the current strategic relations between Colombia and United States this approach has changed. In contrast, Brazilian Protestants had almost complete freedom of religion from the beginning and are still very active. Other sects which have the most promotions in the region include: Jehovahs Witnesses, Mormons, Methodists, Baptists and even Anglicans . Their international presence, especially in the last two decades has also made them active in Latin America. They were previously active mainly in North America and Europe (Rabbani, 2010: 6-13). Enrigue Dussell and Jose Comblin, who are two of the leaders of liberation theology, believe that the Conservative policies of the Catholic Church will lead the poor to embrace Pentecostalism. Accordingly, they have always been trying to convince the Catholic Church to make some fundamental changes in its mechanisms (Haynes, 1999). The growth of Protestantism can be considered an important feature of the region’s Christianity in this century. Today Protestants in some Latin American countries make up a large percentage of Christians who have passionate religious activities and in recent years, numerous international conferences have been held by them. The representatives of all Latin American countries have participated in these conferences (Walls, 1385: 71). At least from the 1960s onwards, the issues of racism, poverty, oppression and exploitation of resources in Latin America were put to debate in the Church. These concerns are rooted in the belief that the mere relief of pain and suffering is not an adequate response to human needs. For some local priests, fulfilling the will of God about humans required making some changes in the society. The spread of this belief made Christians pay more attention to things that had previously been raised by the Marxist school. Marxist economic analysis affected the young priests and theologians of the region for some time (McLellan, 1387: 68-78). Therefore, a theological movement emerged within the Catholic Church in the region, concerned with prioritizing actions and not ideas. It led to a new structure of Christian theology and church organizations in the area. In This movement which is often called liberation theology, the Christian Bible was essentially considered as good news for the poor. At first, bishops and Catholic churches in the region strongly disapproved the new theological approach. Vatican, in a statement, considered the new theology as an invented one and deviation from the message of Christianity. It warned the local churches against the provocative socio-political actions. Despite this condemnation, the new theology was welcomed by a large group of young priests of the area. That’s why, after a while when the church was faced with the tendency of the young priests and the deprived of the region towards the new theology, it prudently accepted it under some conditions (Boff, 1382: 22-26, McGrath, 2001, Grenz & Olson, 1993, Wales, 1385: 7071 and Mostafavi Kashani, 1367: Introduction). Liberation theology which supported the socio-political and economic changes arising from the Christian communities, challenged the strong connection of the church and government. Hence this movement could achieve relative success against the evangelical Protestants many of which had been supported financially and promotionally by the United States, its representatives and pro-government factions and they strongly invited people to their faith. This movement not only reminded the role of the Church in people’s dire poverty, injustice and exploitation of the masses in Latin America, but it tested the real participation of Christians in the “activities” to establish social justice and in this regard, tried social and political actions. The proponents of this theology arose to support the poor. And increasing the poor’s political awareness was part of their basic mission. The theologians of this movement read the Bible with the confidence that the same God who saved the Israelites from slavery in Egypt, is still in favor of the weak and those who are deprived of their rights. They pay attention to the poor and the oppressed and consider the poor as the original source of theology in perceiving and practicing Christianity and they believe the church, despite its dark role in the situation of Latin America, should be pro-poor; because God clearly and without any hesitation stands by the poor. In view of this theology, all the theologies and mission of Christianity should start by dealing with the suffering and pain of the poor. In their view, Christians must begin a fight that will bring freedom from oppression. The true message of Christianity should be the message of freedom and salvation in both social and individual dimensions; because so far, main efforts of the church were concentrated on realizing the individual emancipation and not communal. Therefore, this theology addresses the oppressive conditions or fights against it (Grenz & Olson, 1993; Hemmati, 1379: 99-102 and McLellan, 1997). The translation “Liberation Theology” (1971) by Gustavo Gutiérrez, one of the prominent leaders of this theology into English and other languages, introduced this theology to the West and other continents. The liberation theology was effective in the formation of Feminist Theology and the Black Theology. The mission of Christianity as a liberation thought, and the effect of this freedom on the structures as well as the political and economic interests, was accepted in many parts by the Christians and the priests of the deprived areas of the world such as Africa and Southeast Asia adopted this approach (Walls, 1385: 98). It is about half a century that liberation theology tries to transform religion and the church into transformational elements and factors in Latin America and has made this goal the top priority of its activities. Liberation theology, by empowering ordinary people, getting them involved in evangelism and promoting new social movements, has tried to change the assumptions based on which the ruling power has defined the framework, and to redefine it in a way that it ensures a better life for the masses, especially the poor and the disadvantaged. Since liberation theology has been attacked by the conservatives of Catholic Church, and evangelical Protestants have also intensified their competition, there is a serious question whether this theology can still claim that it can offer an efficient and acceptable program for change or not? The failure of socialism, disintegration of the leftists in the region, the rule of democracy and the return of neoliberal economic policies in Latin America, Vatican’s strong opposition, the defeat of the Sandinistas regime in Nicaragua in the early 90s, and the growth of evangelical Protestantism among the groups of people whom the promoters of liberation theology regarded as its main base, provoked the feeling that Liberation theology was about to fade away. But in the late 90s glimmer of hope for the revival of the theology emerged. The rise of Hugo Chavez with revolutionary, justice-seeking and anti-American approaches in Venezuela as the President made the leaders of this theology active once again. The ongoing process of political awakening in the region at the beginning of the twenty first century by the continuous resistance of Hugo Chavez against sabotage of capitalists and the Americans, the rise of Daniel Ortega as the Nicaraguan President, the election of Evo Morales, Rafael Correa and Fernando Logo (former bishop of the Liberation Church) as the Presidents of Bolivia, Ecuador and Paraguay, have kindled interest in this theology as well as hope in activists (Sadatifar, 1388: 27-32; Rabbani, 1389: 6-13; Gonzalez, 1386: 80-82). Press and media activities of some leaders such as Leonardo Boff has increased in recent years and the election of cardinal Joseph Aloisius Ratzinger as the Pope (Pope Benedict XVI) who was one of the serious opponents of these theologies, also intensified the activities (see: Boff’s personal website). Other effects of this Theology on Christianity, in addition to the presence of its numerous followers in southern continents such as South Africa and Southeast Asia and the expansion of religious freedom, and the justice-seeking wave (for instance the emergence of Black Theology), is the growing influence of non-European and non-Western Christianity within Christianity itself. Currently, Christianity and the religious culture of Europe and North America is being influenced by the Christianity of Latin America (Wells, 1385: 97-98; McGrath, 1384: 236). Liberation Theology, in terms of its nature, has global aspects and at the same time strives to be in close and precise contact with the life of the church. According to Boff, the life of Liberation Theology depends on its adherence to the principles of revolutionary Christianity. Regarding the future of religions in Latin America, Boff believes: “The most important thing now is to communicate with Islam and to find common concepts in Islam and Christianity “(Mostafavi Kashani, 1374: 151). In the current situation, the relationship between these leaders and the committed and revolutionary Muslim scholars, in addition to familiarity with deep Islamic knowledge along with being in contact with the Shiite Islamic centers especially the Qom Seminary, is the least suggestion which can lead to a change in the level of religiosity of the people in Latin America. Washburn, W. (1971). Red Man’s Land White Man’s Law: Past and Present Status of the American Indian. University of Oklahoma Press.
. This festival in Latin America is called Navidad.
. Easter commemorates the visit of the Magi to Jesus at birth (Matthew, chapter III) which marks the first appearance of Jesus to the Gentiles and counts as the Epiphany.
. Evangelical Protestantism: Evangelical Protestantism is one of the schools of the Protestant sects that emphasis on the special position of the Bible in the Christian life. Currently, the evangelical faith is based on four principals: 1. The authority of the Bible 2. Redemption being only possible through the Christian death on the cross 3. The need for personal renewal 4. Necessity for friendship and urgency of promoting Evangelism (McGrath, 2001).
. Pentecostalism: Pentecostal term refers to events that occurred on the day of Pentecost (McGrath, 2001). Pentecostalism refers to the descent of the Holy Spirit upon the apostles on the Pentecost. The term refers to the great movement among Protestants which emphasizes on the Spiritual baptism (Hinnells, 1996).
. World Council of Churches (WCC): The council was formed in 1948 in Amsterdam and aims to promote the unity of the churches regardless of their theological differences. It is considered the most important effort to establish reconciliation between Christians (Hemmati, 2000: 12).
. Anglicans: all the Churches which directly or indirectly are raised by the Church of England and the Archbishop of Canterbury has a high status among all its bishops (See: Rasten, 2006: 17-41). Yasser Asgari / MA in Religion and Spirituality.